Tesco had some good shrimp and mussels in stock, and I really wanted to take my lovely Le Creuset casserole (thanks Tiff!) 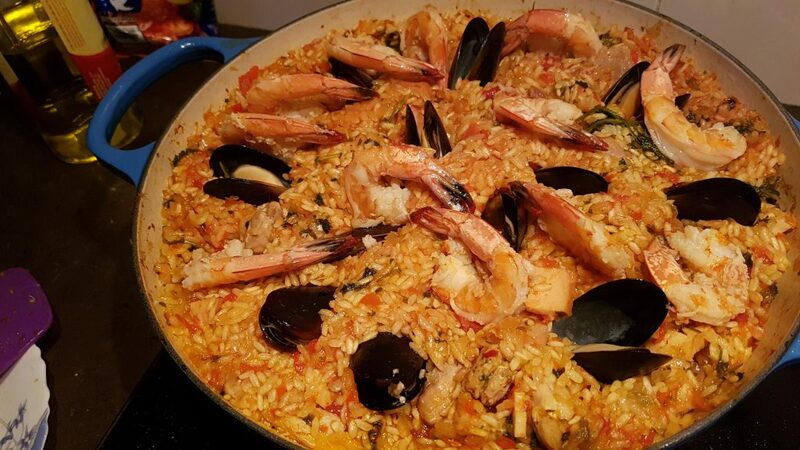 for a spin, so I decided to try making and perfecting a paella recipe. I’ve made this twice now, but am still not fully satisfied with the results. 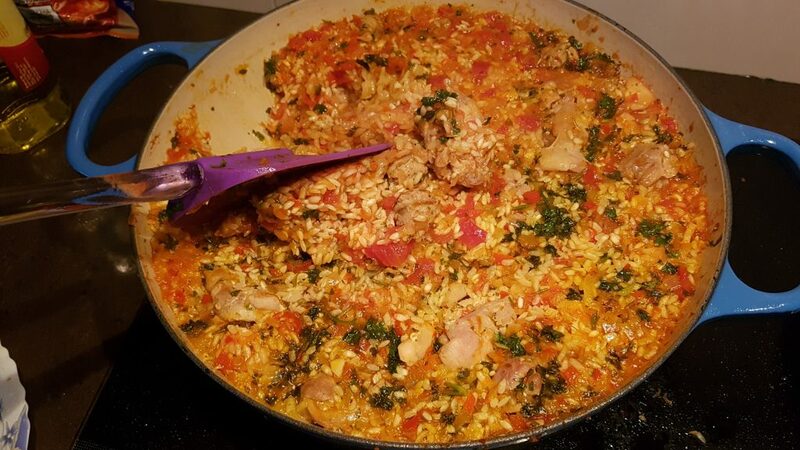 The first time I felt that the meats were not adequately seasoned and there was just way too much rice. 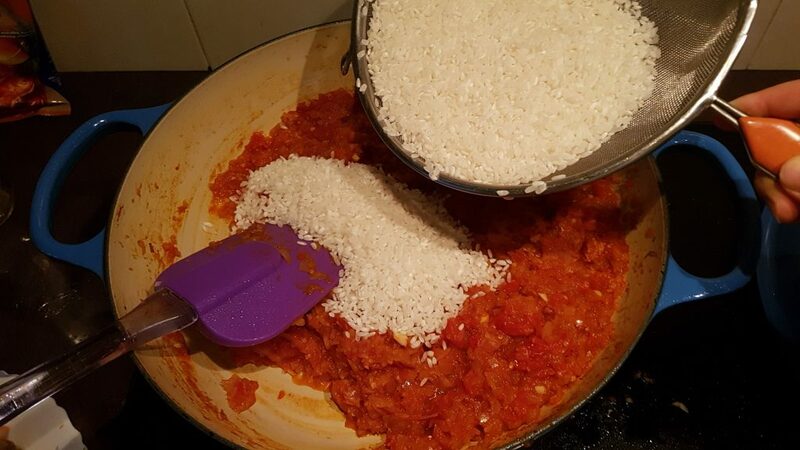 The second time, I used a bit too much liquid so the rice turned out a bit mushy. Flavor-wise I think the rice was nice, but I really need to get the rice to liquid ratio right. 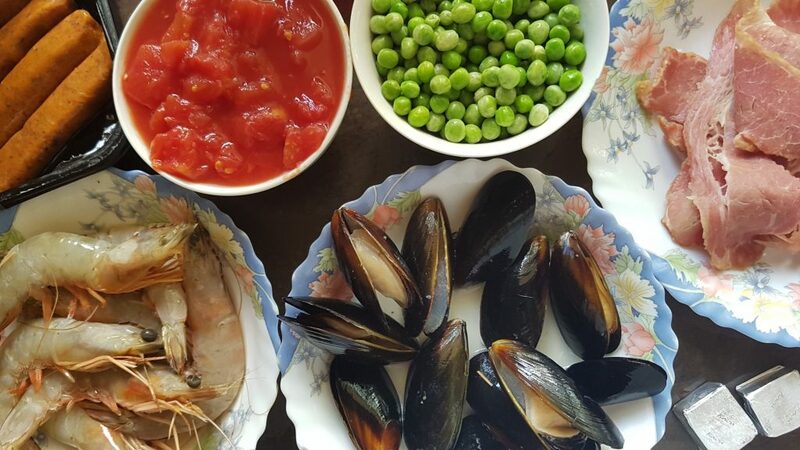 The following recipe has been tweaked with my notes on what I’d do differently next time. From the base recipe I added a few more herbs to the stock mixture, and salt the chicken and shrimp a little for a bit more flavor. 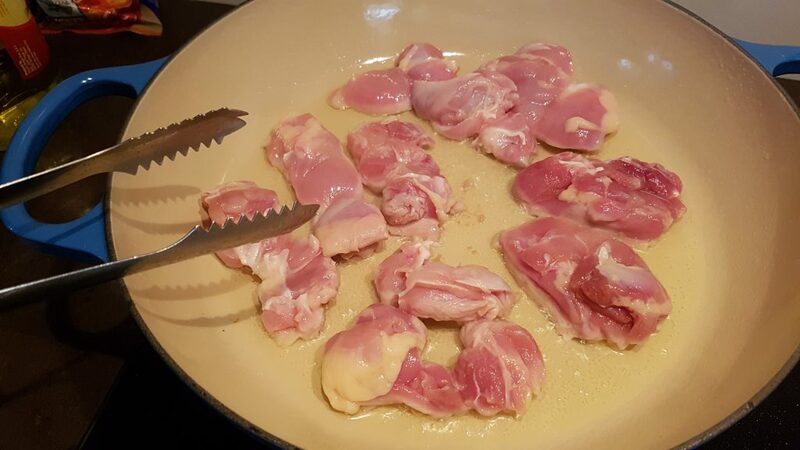 I found using beef bacon resulted in a less salty dish and additional salt might be required, so I tried smoked chicken breast and it gave a nice smoky taste to the dish. 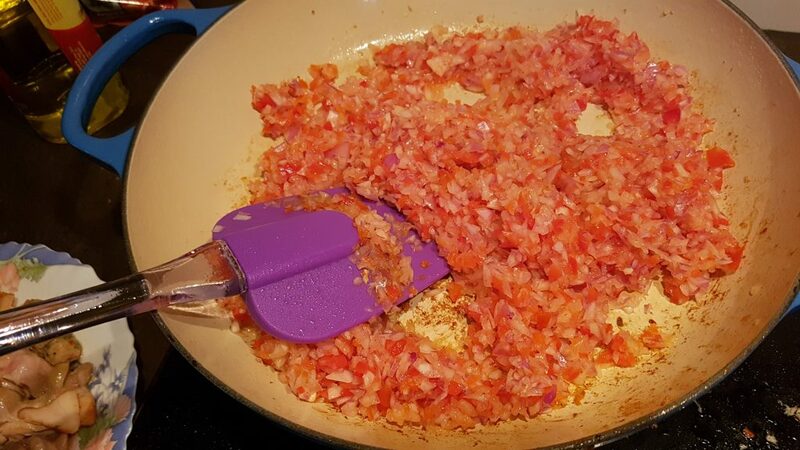 I also chopped my onions and bell peppers using a food processor, for a finer cut as well as to save me a lot of time. I’d use a spicier sausage next time, though, for a bit more kick. Italian just tastes too herby and mild for me. 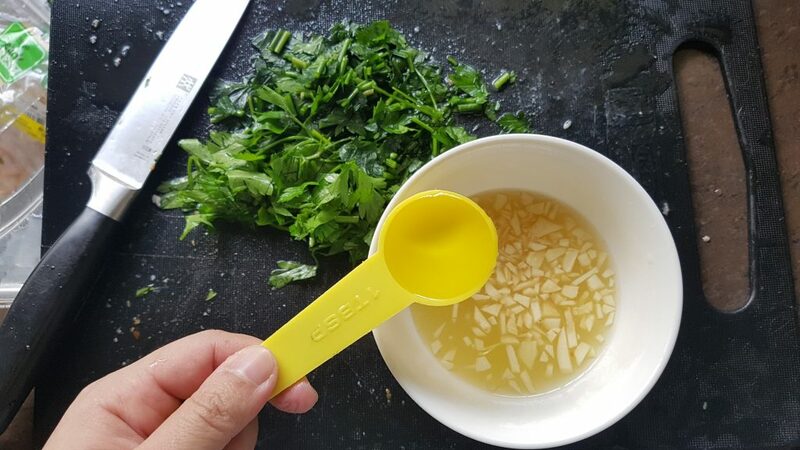 In a bowl, add the parsley, 1/4 cup of the lemon juice, 1 tablespoon of the olive oil, and 2 cloves minced garlic. Stir to combine, and set aside. 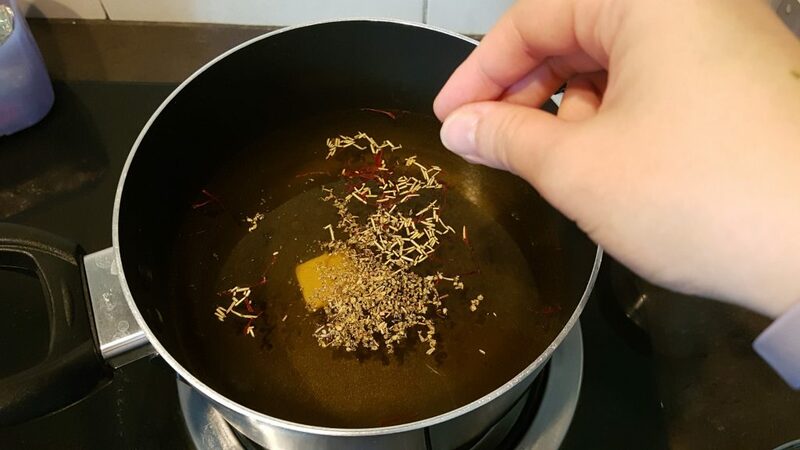 In a large saucepan over medium high heat, add the apple juice, saffron, rosemary, oregano and chicken stock mixture. Bring to a simmer, taking care not to let it boil. Reduce heat to low and keep warm. 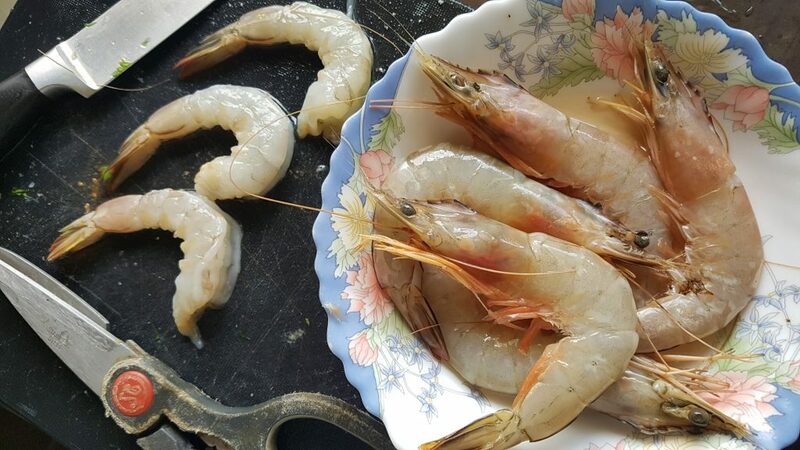 Peel and devein shrimp, leaving the tails intact. Set aside. 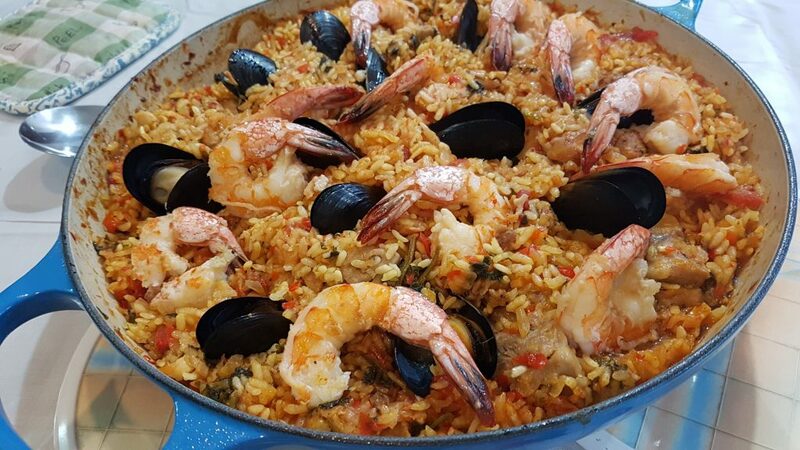 In a large paella pan or skillet over medium high heat, heat the remaining 2 tablespoons olive oil. 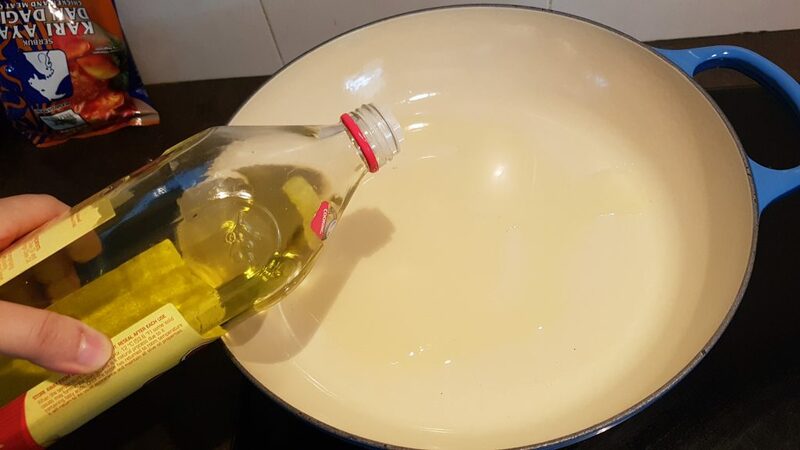 Swivel the pot around to fully coat the bottom with oil. 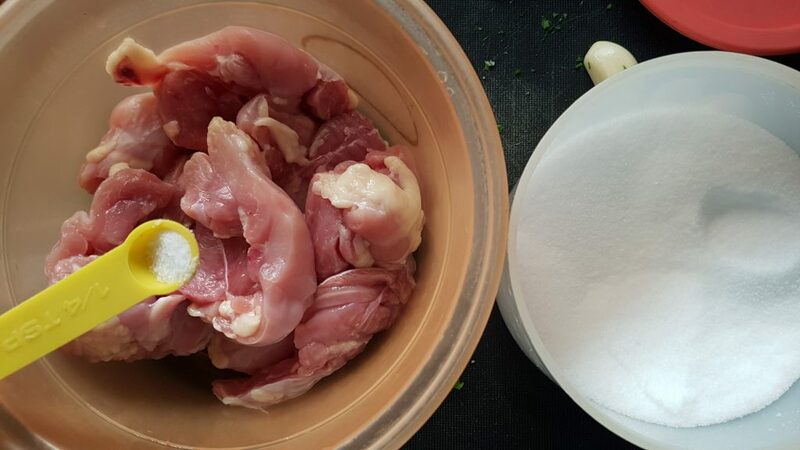 Sprinkle the chicken with a bit of salt. Add to the pan and cook, until browned, about 2 minutes on each side. Remove from the pan and set aside. 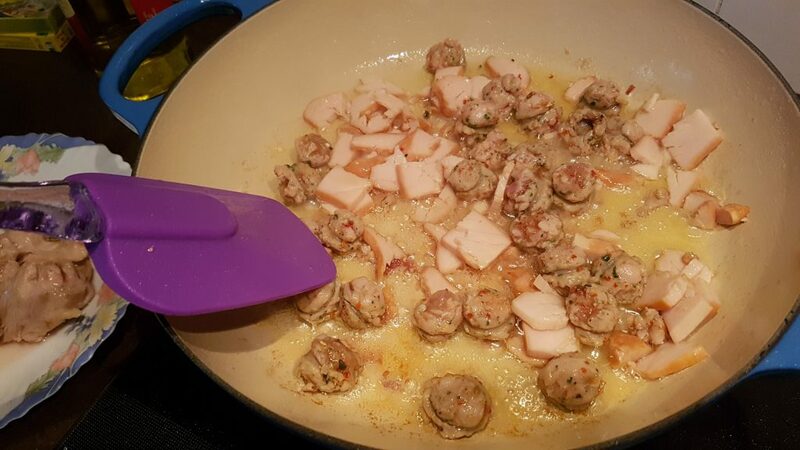 Add the sausage and smoked chicken and cook, stirring occassionally, about 2 minutes. Remove from the pan and set aside. Sprinkle the shrimp with a bit of salt. Add to the pan and cook, stirring, about 2 minutes. Remove from the pan and set aside. Add the onion and bell peppers and cook, stirring, until browned and soft, about 10 minutes. 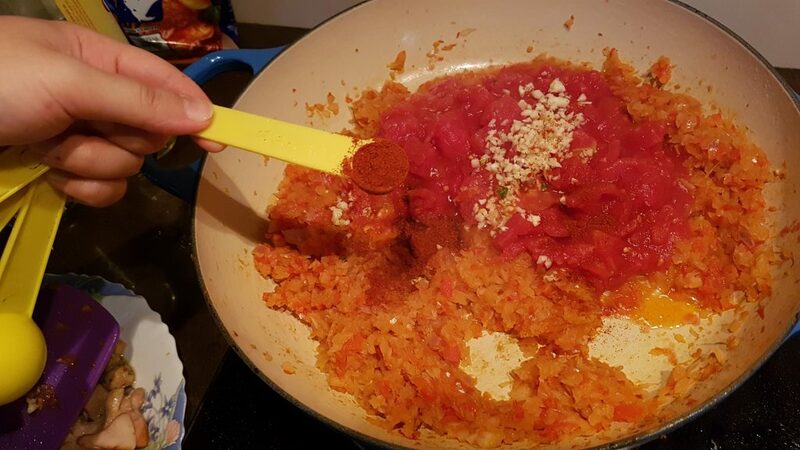 Add the tomatoes, paprika and remaining 3 garlic cloves and cook, stirring, 5 minutes. Add the rice and cook, stirring frequently, about 1 minute. 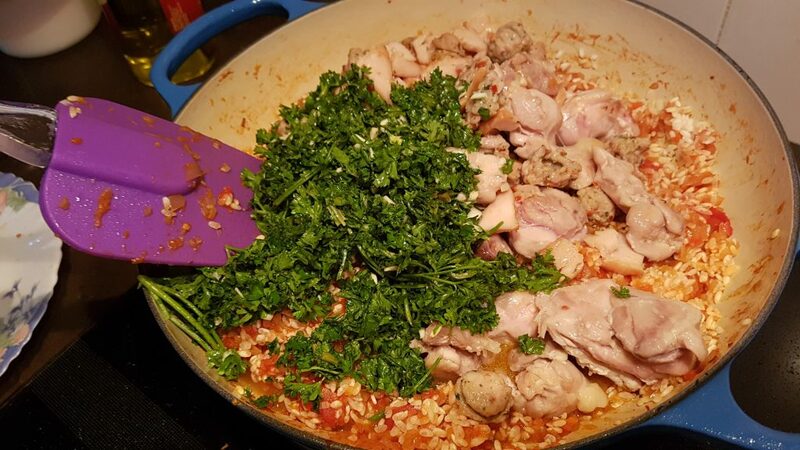 Stir in the parsley blend, chicken, sausage mixture, and peas if using. Stir gently until combined. 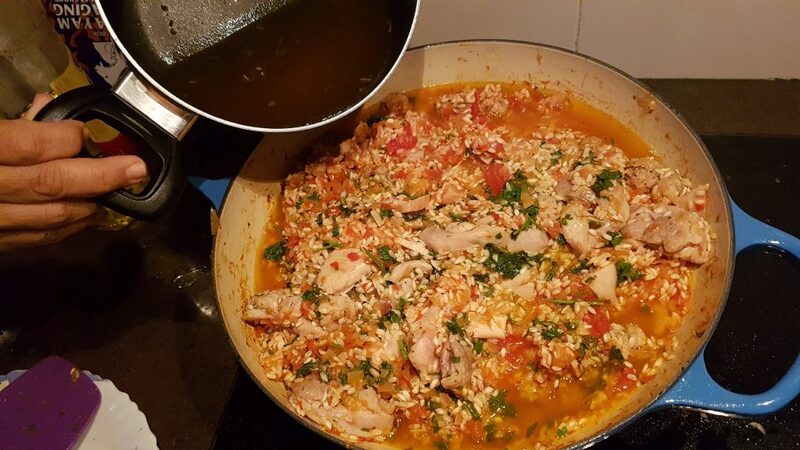 Add enough of the stock mixture to cover the rice. Bring to a steady boil, then lower heat to medium. Cover and cook, undisturbed, 20 minutes. Give the rice mixture one last stir. 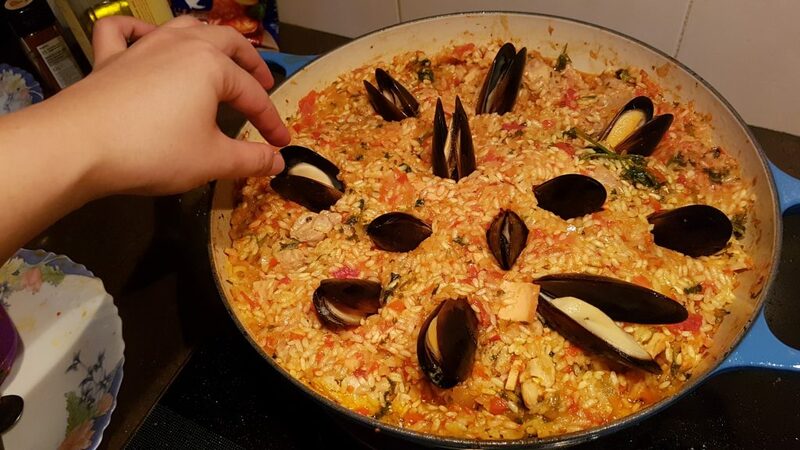 Add the mussels to the pan, nestling them into rice mixture. Cook undisturbed for about 5 minutes, or until shells open. Discard any unopened shells. 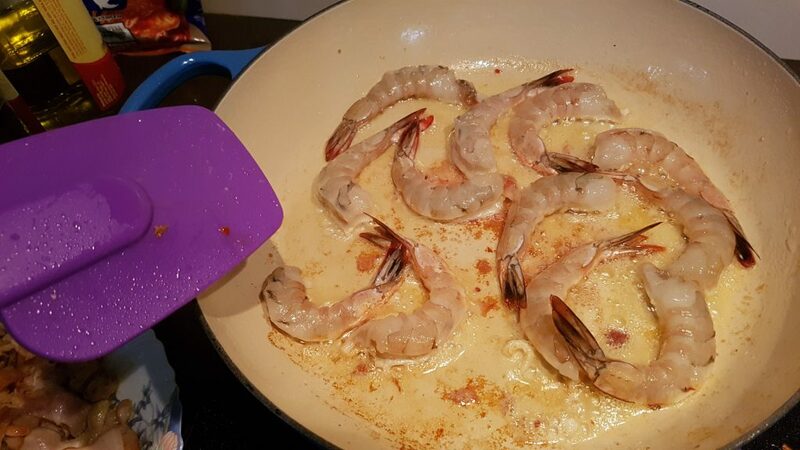 Arrange the shrimp in the rice mixture, heads down and cook undisturbed, about 5 minutes or until shrimp are done. Remove from heat. Cover and let stand 10 minutes. Serve with lemon wedges, if desired.